Koutake mushrooms are small to medium in size, averaging thirty centimeters in diameter, and are irregular in shape with a depressed, funnel-like, curled cap. The light tan upper surface of the cap is covered in dark brown scales that are coarse and textured, while the underside contains frail, grey-brown teeth and white flesh. The cap is also connected to a brown stem known as a stipe that can grow to be seven centimeters in height. Koutake mushrooms are spongy, fragrant with a musky scent, and have an earthy, somewhat bitter-sweet flavor. Koutake mushrooms are available in the fall through winter. Koutake mushrooms are a wild, edible variety a part of the Sarcodon aspratus species which belongs to the Sarcodon or tooth fungi genus. Also known as Neungi, Neungee, and Koutouke, Koutake mushrooms are somewhat rare and are predominately found in Asia, especially in China, Korea, and Japan. The mushroom is not cultivated commercially and is instead found in the wild, growing at the base of trees, and is extremely hard to find due to its camouflaged appearance. Koutake mushrooms are highly valued in Asia for their musky fragrance and earthy taste and are most commonly used in soups to add rich flavor. Koutake mushrooms contain some antioxidants, dietary fiber, iron, and calcium. 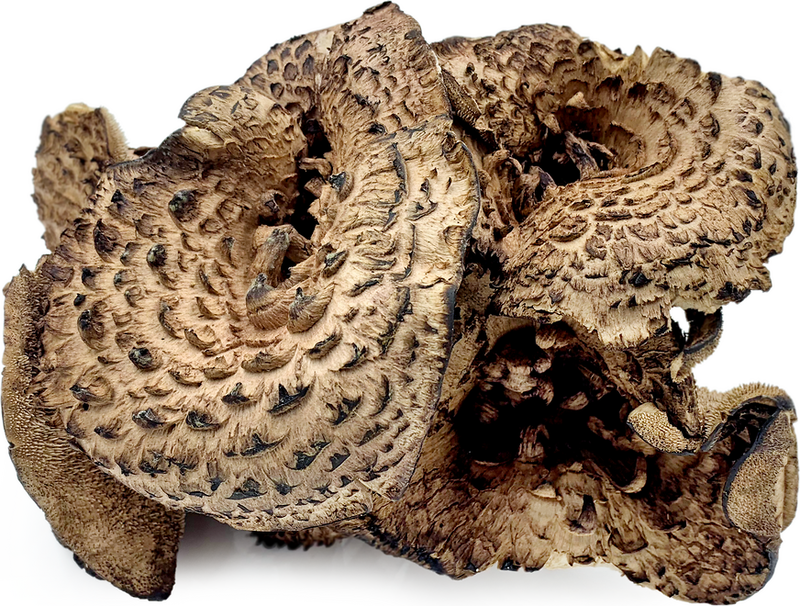 Koutake mushrooms are best suited for cooked applications such as baking or boiling. Their musky scent can enhance the umami flavor in meat dishes, especially with ham, and young mushrooms can also add a sweet flavor to clear soup. Mature mushrooms may have a bitter flavor and can be boiled to reduce the sharp taste. Koutake mushrooms are commonly mixed into porridges, made into a tea in Korea, cooked into bulgogi, or mixed into takikomi gohan, which is Japanese rice served with seasonal vegetables and fish. They can also be dried and stored for extended use. Koutake mushrooms pair well with radish, snow pears, carrots, cucumber, green onions, ginger, garlic, and meats such as boiled chicken, fish, beef, or pork. They will keep up to one week when stored in a dry container in the refrigerator. In China, Koutake mushrooms are also known as Black Tiger’s Paw and are consumed naturally or are used medicinally in teas to help promote relaxation in muscles and to increase blood circulation. The origins of Koutake mushrooms is largely unknown, but they have been found growing wild in Asia since ancient times. Today Koutake mushrooms are somewhat rare and are found at select markets in Asia, especially in Japan, Korea, and China. The photo of the Koutake mushroom pictured above was found at the Tokyo Fish Market.